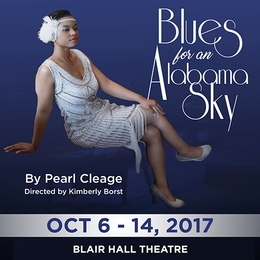 Sinclair Theatre will open the 2017-18 season with Blues for An Alabama Sky by Pearl Cleage from October 6-14 in the newly renovated Blair Hall Theatre, Building 2, on the downtown Dayton campus. Blues examines the conflicting political currents of the Harlem Renaissance as seen through the eyes of 5 passionate African Americans who have been influenced by Josephine Baker, Margaret Sanger, Langston Hughes and other contemporaries. Directed by Kimberly Borst, the cast includes Bryana Bentley, S. Francis Livisay, Justin Lampkins, Erin McGee and Shaun Diggs. All seats reserved: $18 adults/$15 students, seniors and Sinclair employees. Throwback Thursday performances offer all seats at $10. Tickets are available now at www.sinclair.edu/tickets or one hour prior to performances if available. Thursday and Sunday performances are American Sign Language interpreted. Fri., Oct. 6 – 8 p.m. Sat., Oct. 7 – 8 p.m. Sun., Oct. 8 – 2 p.m.
Fri., Oct. 13 – 8 p.m. Sat., Oct. 14 – 8 p.m.